h1. Introduction The idea of using solar radiation to generate air convection that can subsequently be converted to an energy source has been around since the start of the 20th century, when a Spanish Colonel called Isidoro Cabanyes proposed it in a scientific magazine. 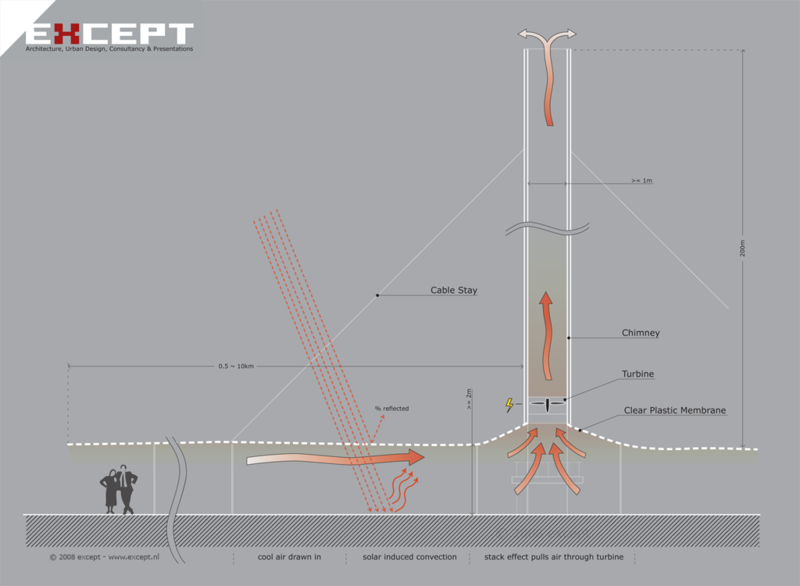 Solar Updraft towers, also called solar wind or solar chimney plants, provide a very simple method for renewable electricity generation, with a constant and reliable output. Other renewable energy sources such as wind turbines and solar arrays suffer from high diurnal and seasonal fluctuations, or unpredictable patterns of output. Due to the large initial investment required, unfamiliarity with the system and the solar updraft tower's relatively low capture efficiency, only one prototype was ever built, in the 1980's in Spain. This prototype however, performed above and beyond expectations, and continued to operate for almost 7 years after its designed life span of 3. The solar updraft tower has been left on the shelf due to its perceived low efficiency, which is to a large degree undeserved. Most studies on this elegant and simple renewable energy producer consider the land occupied by the tower and its collector as one of the largest resource inputs required for this process. However, Except Architecture & Consultancy is investigating the possibility of more creative applications of the system, which would combine the tower with other land uses. 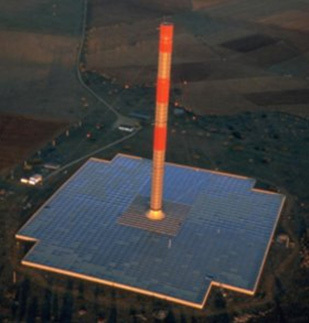 The small experimental solar updraft tower plant, built in Manzanares, Spain in 1982 by Schlaich Bergermann, can be considered the classic example of the system. The design calls for a large, unused plot of land to house a collector between 500 m and 10 km in diameter, with a centrally located chimney ranging from 100 m to 1 km in height. The collector is a transparent membrane suspended several meters off the ground, which can be made of glass or a strong transparent polymer. Sunlight penetrates this membrane, and the solar radiation is converted to heat upon hitting the ground. The air underneath the membrane quickly increases in temperature due to the greenhouse effect and flows towards the chimney, which, through the stack effect, becomes the lowest point of pressure in the system. This continuous airflow spins a turbine located at the base of the chimney. The nighttime difference in temperature between the ground and the air allows this effect to continue. Thermal storage devices can be used to smooth out the differences in intensity between night and day temperature differentials. As with other solar technologies, a higher latitude placement translates into a lower energy output. The majority of the cost associated with solar updraft towers is the initial investment required. By contrast, operations and maintenance costs are very low. The system is simple and very reliable. The parts that require maintenance are close to the ground and rely on elementary, proven technologies. One of the largest expenses is the cost of land, which means that the interest rate for financing that purchase is a major factor in determining the cost of the electricity produced. This makes the solar updraft tower a very suitable energy plant for remote, arid areas near the equator with inexpensive land. Estimates for the cost of electricity produced range from 5 eurocent per kWh up to 25 eurocent, depending on the cost of land and the financing scenario. By comparison, a normal gas operated power plant can produce electricity for as little as 5 euroct/kWh. Except's investigation in combined land use may increase the financial viability of this renewable energy technology dramatically, allowing it to be applied beyond its current potential as an affordable developing world technology to a high tech source of first world power generation. 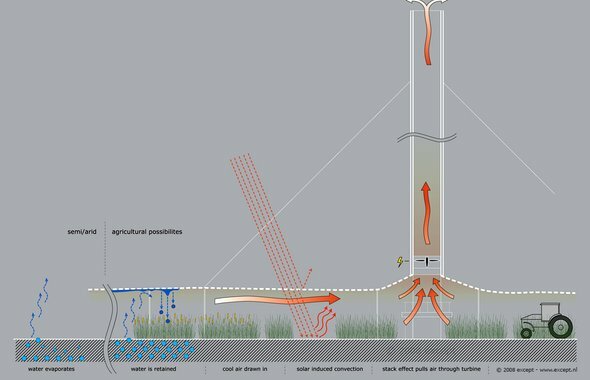 An important side effect of placing a large transparent membrane over an area of land is the capture of evaporated ground water and its return back to the topsoil. 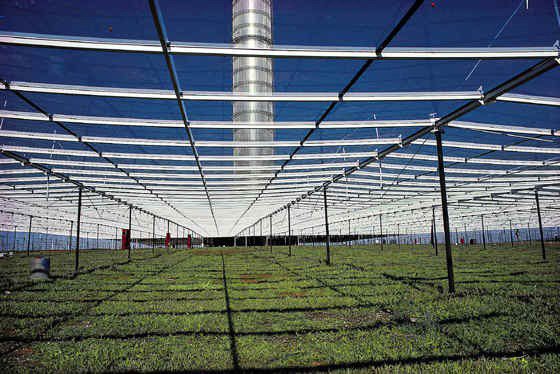 This localized increase in land moisture can make the soil underneath the collector suitable for agricultural uses, through the effective creation of a partial greenhouse. In some cases, the land under the collector would not have been agriculturally viable without the presence of membrane. This means that certain barren lands could be reclaimed for productive use, making this energy generation strategy more economically favorable while also building agricultural capital. The clearance height underneath the collector can easily accommodate farm equipment, and the supports for the collector can be far enough apart to allow the working of the land. Different kinds of crops can be planted depending on the local soil and moisture conditions, bearing in mind that the area near the center will have airflow too strong to allow plant growth. 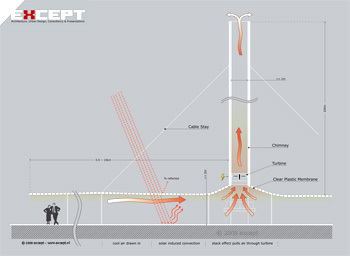 If the vegetation is very substantial, it may impact the output of the tower due to wind drag. However, increasing the distance of the membrane from the ground can mitigate this. 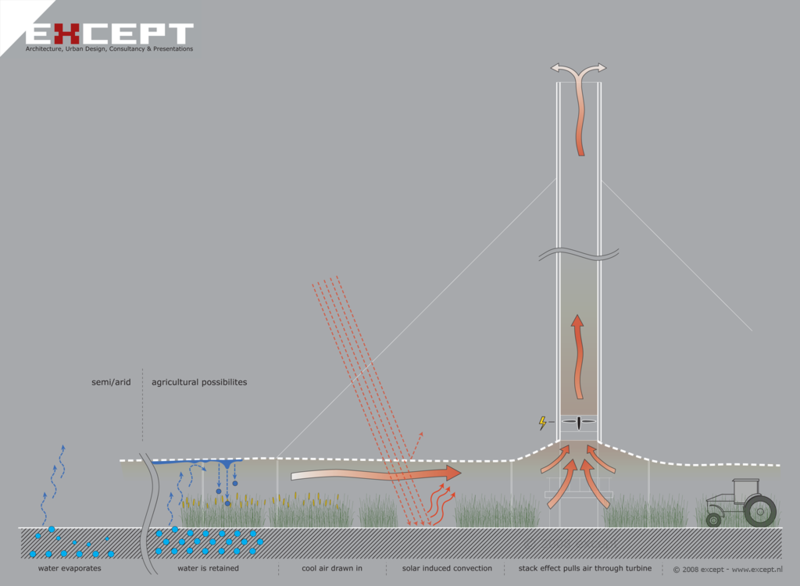 Another potential agricultural use is the application of algae growth tanks underneath the membrane of the tower. Closed culture tanks for biofuelproduction using for instance Botryococcus algae or open culture tanks with Spirulina as a nutritional source could expand the potential of the land to a large degree. Tanks underneath the membrane can then function as thermal storage to reduce the effect of diurnal swing as well. The water for the tanks can use rain water collection performed by the membrane, as well as ground water. In desert situations salty groundwater can be desalinated using solar desalinators also underneath the membrane, depending on the water conditions and the type of algae grown. 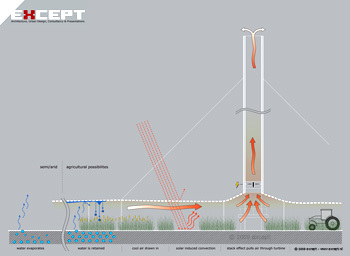 Using agriculture in combination with the updraft tower this system can be applied as both a sustainable economic strategy or for community restoration in developing nations. Other solar technologies, such as collectors that use solar radiation to convert water to steam or photovoltaic (PV) arrays, generate substantial excess heat. In the case of PV, high temperatures diminish their power generation capacity. Using the solar updraft tower in combination with solar collectors or PV arrays can improve the efficiency of both systems. 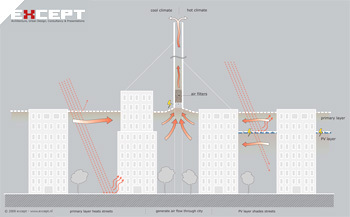 The constant wind flow can air-cool the collectors while increase the energetic output per area of land used, making the solar updraft tower a more efficient proposition. Things to consider in terms of the efficiency of combining these systems include the loss of some direct solar radiation as a result of its deflection by the membrane, and the amount of cooling that can ideally be achieved. This strategy can also be combined with agricultural uses, where solar collectors or PV arrays would be placed at the center of the collector, where the winds are too strong for plant growth. 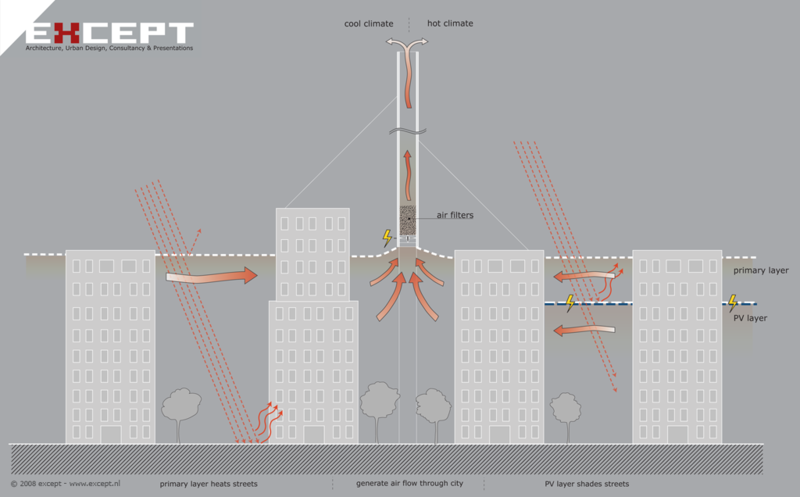 A completely different alternative use is the urban application of solar updraft towers, which is not necessarily conceived of primarily for its energy generating capacity. A tower in a city could hardly be the size of one in a field, so its generative power would be diminished. However, it could provide three distinct advantages alongside electricity generation. 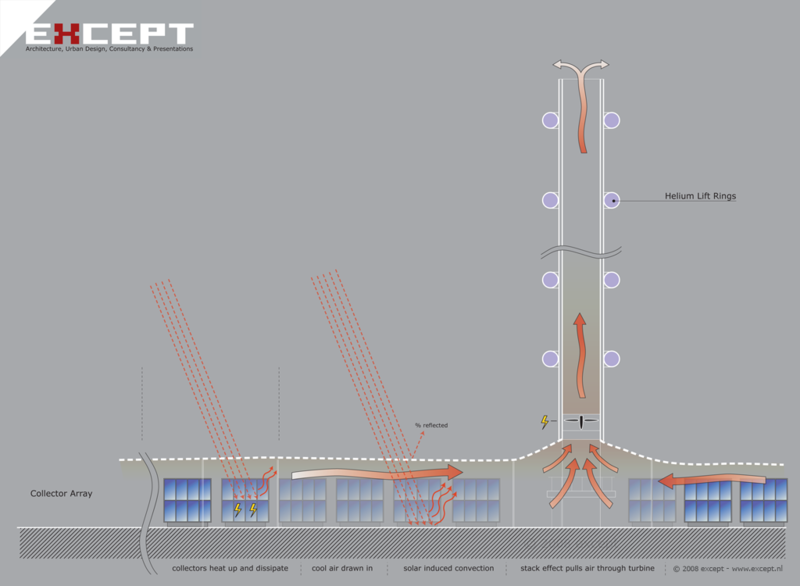 First, the tower could be fitted with particulate, carbon and other air filters. 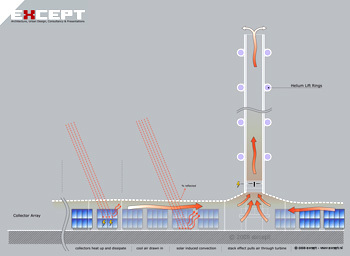 The air rushing through the chimney would thus be cleaned resulting in urban air quality improvement, while at the same time generating some electricity. Systems like these would be very suitable for highly polluted cities. Second, in cold climates, the heat dissipation of the urban environment can be buffered. The trapped heat will aid the power generation, but will also reduce the temperature gradient between interiors and exteriors, resulting in energy savings for building heating and higher insulation efficiencies. Third, in hot climates, a second layer with a semi-transparent PV membrane could be installed. This would partially block out the sun, causing the temperature gradient to drop. There will then be two layers generating convection, possibly increasing the efficiency of the tower. The top layer would ensure the heat is not trapped in the bottom layer, thus preventing the heating up of the city. The constant air pull of the solar updraft tower will partially combat the heat island effect. Solar updraft towers do not need to be placed on any specific land type and they are flexible in the height of the collection membrane. The efficiency of the tower might change depending on the resistance of the ground, but the advantage of using land for a productive purpose while at the same time using it to generate electricity is a very attractive prospect. The Solar updraft tower is one of the simplest and most straightforward of all renewable energy systems, and if designed appropriately, it can be applied in a great variety of circumstances. It lends itself well to the redevelopment of economically depleated areas, and for the generation of electricity in remote areas without the need for large maintenance crews. Except is currently investigating several other uses of the solar updraft tower, both for remote electricity generation and for urban use.